Chain Mail is a 20 ine slot found at Microgaming casinos. It has a medieval theme and a pick a box style bonus game. Max bet is 100 coins and the top jackpot is 6,000 coins (30,000 if you are betting max). Coin sizes start at one cent. 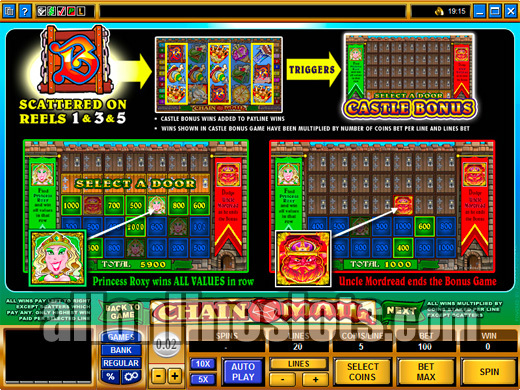 Chain Mail is a video slot with a double edged theme. On the one hand you see symbols such as castles, kings and a princess and on the other hand you see mail bags and a wax seal on an envelope. This is quite a nice twist on the medieval theme with the chain letter theme. The game has 20 lines and 5 reels. It gives you the option to bet between 5 and 1 coin per pay line which makes for a total maximum bet of 100 coins per spin. Luckily it comes in a good range of coin sizes including the 1¢, 2¢, 5¢, 10¢, 20¢, 25¢ and 50¢ denominations. The wild Chain Mail logo offers the highest win on the reels with a 6,000 coin jackpot multiplied by the amount of coins per line or up to 30,000 coins at max bet. The scattered mail bags take the second highest pay award with up to 10,000 coins to be one if you hit five of them anywhere on the reels. From there the princess, the king, the horse and the mail box pay 800, 400, 300 and 150 coins respectively. The food symbols such as the pizza and the "KIngs Fired Chicken" all pay 100 coins or less. The drawbridge symbol appears on reels one, thee and five only and is the key to unlocking the bonus game. You need to get all three to move to the bonus stage. There is a loud "thud" sound when you hit the first, second and third in that order so you definitely know you are on the way to the second screen. If you have ever played IGT's Addams Family : Cousin Its' Bad Hair Day you will know the bonus. 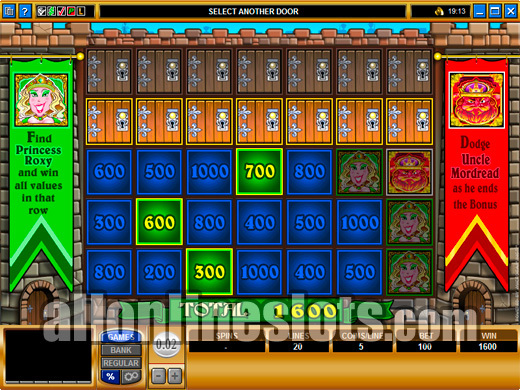 The game is divided into five rows of seven doors (See Bonus Screen). You get to choose one door from each level to reveal your prize. There is a great twist to this. If you pick a door with Princess Roxy you get EVERY prize in that row. Unfortunately there is also Uncle Mordread who appears in the top three rows and ends the bonus round if picked. 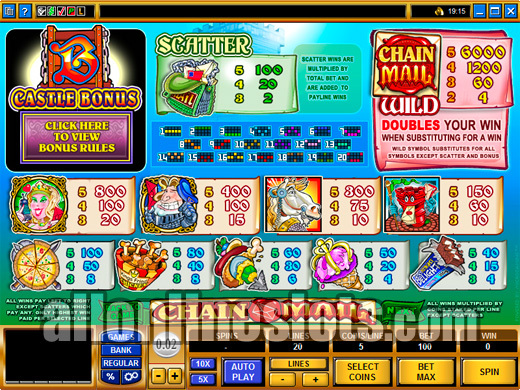 Overall, Chain Mail is an innovative slot with a bonus game we have never seen online before. It has a great top prize of 30,000 coins and comes in coin sizes as low as a penny. 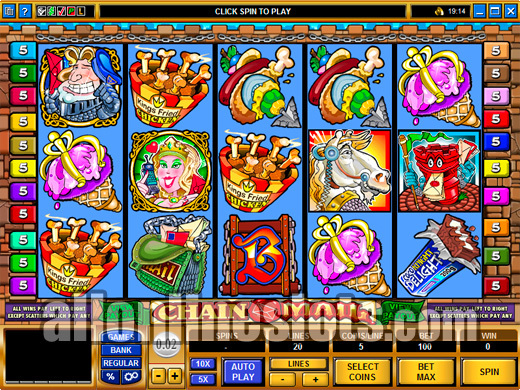 All of this combines to make for a very entertaining game to play that suits all gambling budgets.